Despite having existed for more than a decade, virtual cards have been applied to a limited range of business cases for much of their history; primarily Business to Business (B2B) travel purchasing and commercial vehicle fleet management. However, the benefits of card virtualization are starting to evolve outside this narrow application, which is already having an impact on adjacent sectors -- including a move by several fintech players into the business to consumer space, thereby augmenting online account security through the use of their virtual cards. According to the latest worldwide market study by Juniper Research, the annual value of virtual cards (e.g. temporary card numbers only available for a single transaction or limited time) used by businesses will grow by 90 percent over the next four years -- exceeding $1 trillion by 2022. This is up from an estimated annual value of $568 million in 2019. However, Juniper analysts believe that the technology will struggle to establish itself among several other global online payment methods -- making up a small proportion of B2B money transfer transactions overall. 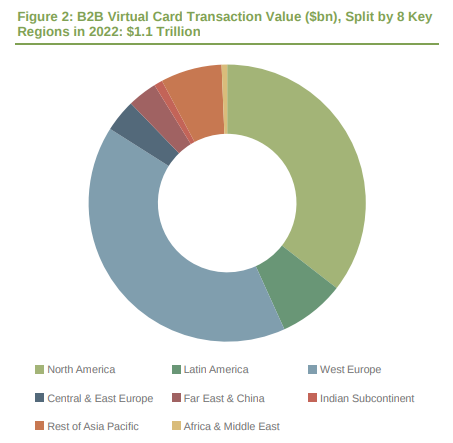 The new market study findings note that financial services will be the fastest growing adopter of virtual cards, with transaction volumes growing at an average of 18.3 percent between 2019 and 2022. Commercial cards are well-established in fleet businesses, but virtual card growth will be slow here due to the need for payments at a point-of-sale (POS) when purchasing fuel for vehicles. According to the Juniper assessment, healthcare has the potential to become the highest value sector for B2B virtual cards, representing $277 billion in transactions by 2022, but adoption may be low within this sector. As an example, the research findings anticipate that only 4 percent of healthcare institutions globally will adopt virtual cards, due to the relatively high processing charges. Juniper expects virtual cards for consumers to generate over $14 billion in revenues for card providers by 2022, primarily from remote purchases. Companies offering these services are typically positioned as protecting consumers’ privacy, offering other digital ID-based services alongside their virtual cards. "Virtual cards offer a number of financial management possibilities, for both business and consumer use," said James Moar, senior analyst at Juniper Research. "However, the limits of the technology currently mean that virtual cards need to be part of a wider payment or security product."